Discover and purchase the latest children’s books and content from across the region at the AFCC Book Fair! This year, the fair will showcase a wide selection of multilingual children’s and young adult titles (including specially imported books and illustrated prints/paper memorabilia) from local and international publishers. There will also be book launches, book signing sessions and other book-related activities during the fair. If you are interested in taking a booth at the fair, please proceed to AFCC Book Fair Application. Closetful of Books is a specialist children’s bookseller started by Denise Tan and Kelvin Ng. They grew up accompanied by magical stories, and continue to believe in the power of reading for pleasure. Closetful of Books also visits schools with a vast and specially-curated selection of picture books, novels, non-fiction titles and graphic novels, and extends library consultancy services to schools. Alkem Company is a regional distributor and publisher for books, training materials, E-learning, E-Books, educational aids, multi-media, research software and training kits. Their products cater to schools, higher education, research, professionals and training sectors. ALS Asia Pacific is a holding company which is involved in a diversified business portfolio that engages in a cross border educational landscape. It is committed to deliver VALUE ADDED SERVICES, focusing on CUSTOMER CENTRICITY and ensuring SUSTAINABILITY as a TRUSTED PARTNER in promoting and providing ENRICHING CONTENT. Armour Publishing is a leading independent publisher for Singapore and the world. Established in 1991, Armour has published many best-selling titles for the education, general, children and Christian markets. Armour publishes children's books under the Little Knights imprint. These books help children grow their love for reading through compelling stories that are educational and promote good values. Asiapac Books specialises in educational comics and illustrated books. They publish books on history, philosophy, literature and culture. For young readers, their books encourage development in life skills, values and character. They are launching a new imprint, Loving Books, dedicated to beautiful picture books that inspire a better world in 2018. Balestier Press publishes contemporary literature in a globalising world, children's and young adult literature, humanities and social sciences. The Children Book Design and Illustration Course was initiated in 2009 with the aim to improve the quality of children's books through research and practice using Indonesian local content. This course is attended by students of the Faculty of Art and Design - Bandung Institute of Technology. At HansVision, they promote fun and engaging learning of the Chinese language using technology in ways that can easily be understood. Let's Play and Learn! English Corner aims to bring quality English Science magazines to children enriching them with science knowledge beyond school curriculum. For 18 years, English Corner has delighted children with the Science Adventures series, the first and only home-gown science comic series. In 2018, English Corner will continue to inspire children with the “Great People” series. Epigram Books was set up to champion Singaporean literature. It publishes mainly fiction - from picture books to graphic novels to literary bestsellers. Its authors have won all the major book prizes, including the Hedwig Anuar Children's Book Award, Singapore Literature Prize and Singapore Book Awards since it started in 2011. It also sponsors Singapore’s richest literary award, the annual Epigram Books Fiction Prize. ILOVEREADING.SG is a Singapore-based education publisher for iTHINK, Inspire & i, resources that are specially designed for ages 10 to 18. ILOVEREADING.SG aims to cultivate a passion for reading in each child and are constantly looking out for excellent reading materials to serve the local and international communities. Their vision is to help each child acquire skills in language and vocabulary through reading. Lingzi Media is a publishing and distribution company established with the aim of promoting the Chinese language in Singapore. Since 1993, Lingzi has worked with writers and educational institutions to produce a wide range of literary and non-fiction titles, and it has developed into a leading company in the fields of publishing, culture and education in Singapore. Maha Yu Yi is a children’s bookshop specialising in Chinese titles for 0-12 years. Their range includes baby board books, picture books, bridging books, story books & comics by authors from around the world. They distribute their books to the National Library, preschools, local & international schools. They also organise book fairs for schools. As one of the largest general reference and interest trade book publishers in Southeast Asia, Marshall Cavendish Editions provides readers with a wide collection of print and digital content encompassing biographies, business, politics, travel, cuisine, culture and heritage, fiction, health and self-development. Media Ministry, formed in 1975, is the book distributor and publishing arm of Cru Singapore, a Division of Cru Asia Ltd. They seek to equip, provide resources and assist churches and mission organisations around the region to help the communities they serve - to develop, grow and flourish through the provision of life transforming, Bible inspired, literature. Mini Monsters Limited is the pioneer and forerunner of Malay children’s educational content founded to instil a lifelong love for the Malay language for today’s generation of children. Its approach in innovating and developing its creative content for children is reflected in its successful amalgamation of its present programmes into multiple media platforms. Mini Monsters continues to serve the motto of “Berhibur dan Belajar” (Entertain and Educate). Pan Asia Publishing Pte Ltd was established in 1984 to publish Chinese, English and bilingual stories for children. With the strong philosophy of “Read Today, For a better tomorrow”, Pan Asia’s content is to motivate and educate children and to instil in them a love of language and culture, respect for lifelong values and a joy of reading. At Pen Pal Whizz, they look into how children's reading and learning experiences can be enhanced with the blend of digital technology and traditional learning methods. Pen Pal Whizz works closely with international publishers and educational institutions to produce quality reading materials for young children. Pustaka Nasional Pte Ltd (PN) is a Malay language book publisher set up in 1963. The company publishes fiction, children's books, religious and literary non-fiction mainly in Malay though it also publishes books in Arabic and English. To date, PN has over 1,000 publications in print, audio and ebook editions. Abrakadoodle is all about creativity for kids, and since it was founded in 2002, has delivered the very best in visual arts classes for kids, summer art camps, holiday art camps, art parties and art events to more than one-million children in schools, community sites and Abrakadoodle art studios for kids around the world! Their art programs are suitable for children 20 months to 12 years old. Diploma in Creative Writing for TV and New Media (DTVM), Singapore Polytechnic, is the only writing course in Singapore. At DTVM, students learn to ideate and create stories, put them into words and visuals and fine-tune them into polished products for various media platforms. Students are also trained to write and produce news articles, documentaries and create concepts for scripted and entertainment programmes. Founded in 1993, Singapore Repertory Theatre (SRT) is one of the leading English language theatre producers and presenters in Asia. In addition to its repertoire of original musicals, the company also produces a number of critically acclaimed plays. SRT is also one of the biggest producers of children's theatre in Southeast Asia. The Little Skool-House is more than just a 'skool'. With the belief that every child is a wonder, they create an environment that nurtures learning while providing a sense of belonging. By inspiring children to explore, create and discover, they develop their talents and potential to live their own stories. Together with the global community, they prepare children to be thinkers and tinkerers, leaders, risk-takers, inquirers, communicators and innovators who will someday make their mark in the world. 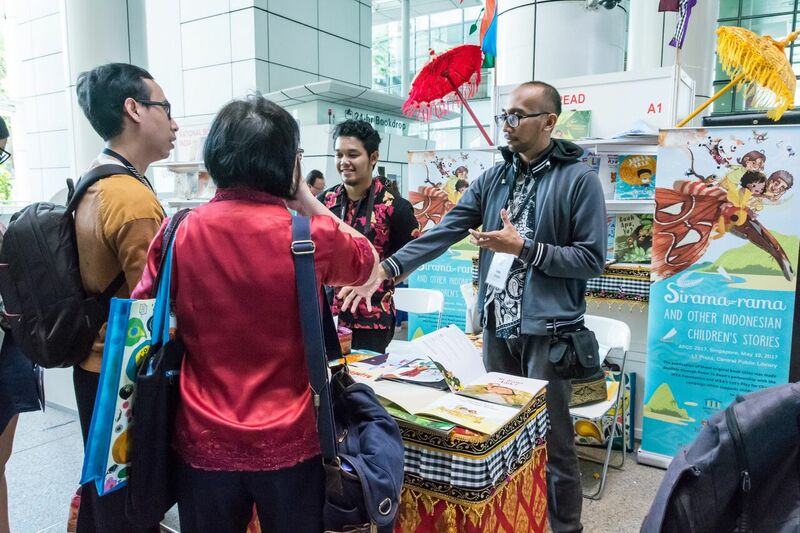 Ungu Pen aims to be the leading publisher, retailer and distributor of good quality and contemporary Malay, English and bilingual books for children and young adults. They support high quality books and learning resources by Singaporean authors and publishers as well as works from around the region. World Scientific publishes 600 new titles a year and 135 journals in various academic fields. Many of its titles are adopted as textbooks by renowned institutions such as Harvard, California Institute of Technology, Stanford and Princeton. They also publish a list of children’s books under the WS Education imprint. Zakatha is an online bookstore specialising in children's books from India in the various languages including Tamil, Hindi, Marathi, Telugu, Malayalam, Kannada and English. Zakatha specialises in folk stories and mythology from Panchatantra, Amara Chitra Katha and other collections. It also distributes bilingual and award-winning books. Orders are delivered to the readers.